With a new head coach at the helm, RIT’s wrestling team is off to a brand new and exciting start. Head coach Jason Bovenzi, who has smoothly made the transition from his former assistant position, is very eager for what this next chapter may have in store for the team. "With wrestling, you could do everything you want and work hard - but you've got someone else who is out there on the mat that wants the same exact thing as you." However, according to Bovenzi, the team is constantly rising to the challenges that the sport presents. “The guys that we have want to be good. They’ve really embraced the training and the technique, and they’re applying it,” he said. If the demands of wrestling season were not enough, these guys have placed some difficult expectation on themselves as well. When asked what their goals for the rest of the season were, Sepor, Greenquist, Weinger, and King all immediately answered that they would like to be an All-American, an award given to the top 8 finishers in their section at nationals. "I want to create an environment where they feel like they can be successful." 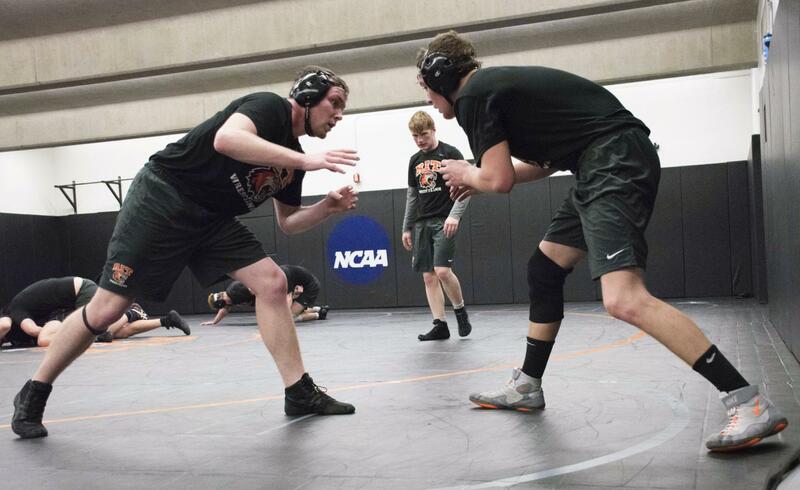 Without question, this is a thrilling time for RIT’s wrestling program. In order to see the team compete, come to the Clark Gym on January 25 as they take on Brockport in a key matchup before regionals. Not only will this competition be the team’s Tiger Den event, it will also be the senior night for many of the team’s top performing athletes. So come out and show your Tigers some support!